Work to preserve the Wesleyan Chapel site at Killeheen is on going. We acquired the site some years ago, and it is important to protect and mark the spot where many Irish Palatines worshipped. 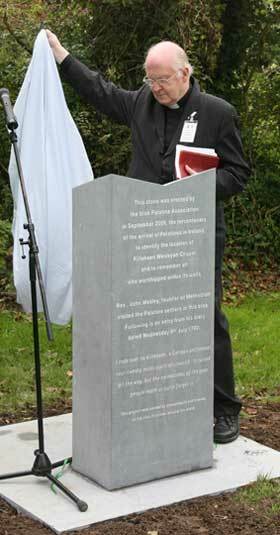 As part of our tercentenary celebrations in September 2009 a stone podium was unveiled at the site by Rev. D.A. Levistone Cooney. The ceremony was attended by tercentenary participants as well as members of the local community. This project was funded by descendants of Irish Palatines from around the world. The Association acquired and fenced off the 0.165 acre site of the Killeheen Wesleyan Chapel a number of years ago. Up to this time, the site was otherwise unmarked and had become overgrown with the passing of the years. The original thatched chapel that once stood upon the site was known locally as the “Preaching House”. It served the Killeheen Palatine Community as a place of worship and as a school house during the week to educate Palatine and other local children, Roman Catholic and Protestant. A report by the Commissioners of Irish Education Inquiry in 1824 described the school as being housed in the Methodist Preaching House which was built of stone, lime and thatched. The value of the building was set at thirty pounds. The master of the school at that time was Patrick Dillon who received an annual income of £20.00. It was recorded that up to 120 pupils attended the school. Some 90 male and 30 female. It was a fee paying school. The Ordnance Survey of 1840 pinpoints the chapel as 31 chains to the south east of Reens Turnpike. The Chapel was closed in 1876 with the sale of some of the items from the Church. • The Pulpit Bible - features in the Irish Palatine Centre exhibition, donated by Albert Bovenizer. • Killeheen Partners Agreement relating to items in the Church - features in the Irish Palatine Centre exhibition, donated by Austin Bovenizer. • Rev. Michael Fitzell Bovenizer Letter in which he writes, that as a small child he remembers looking through a window of the Chapel from the shoulders of his cousin and being told that John Wesley once preached from its pulpit. - with the Irish Palatine Centre, donated by Austin Bovenizer. • Entrance Gate – with the Bovenizer family. • Killeheen Partners Minute Book, in which there are entries relating to the chapel – with the Teskey family, Killeheen. Further development plans for the Church site include the building of a stone boundary wall, the return of the original entrance gate, some stone seating and the erection of an information sign which will include the names of those who financially supported the project. If you would like to consider supporting this project please print this form and return it with €100.00 or more if you wish, to The Irish Palatine Association, Irish Palatine Centre, Old Railway Buildings, Rathkeale, Co. Limerick, Ireland. Your payment can also be submitted in an equivalent amount in your own currency by personal cheque. Ken & Janice McDonald, UK. Photograph of Rev. D. A. Levistone Cooney unveiling the stone to mark Wesleyan Chapel site at Killeheen.